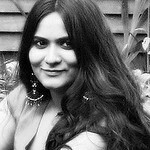 A warm hello on a very warm summer day to all warm and lovely readers of Monsoon Spice. How are you? What is happening at your end? Oh, I can go and on as it’s been more than a year since this blog had any food posts. So much has happened in a last year or two and I don’t know from where to start! All of a sudden words seem to have deserted me! My mind is bursting with thoughts and memories which I want to share but they just don’t seem to be budging and flowing at my finger tips. Alas! I am at that phase again. A writer’s block!!! Still my honest desire to breathe some life into this empty, neglected space is the real driving force. So writer’s block or not, I am here today to share some simple recipe with you all. So what we have today is some sweet, sour and spicy Mango Pickle/Relish. Take one large peeled and diced mango and cook it with little jaggary for sweet note, some green chillies for spicy hint and temper it with some aromatic spices and herbs. Now that is simple, isn’t it? A child’s play if you ask me. But I have to warn you in advance before you tie your apron and head into kitchen to make this. This is a serious warning as this is seriously addictive Mango Pickle/Relish and there is 99.9% of chance that you will end licking the jar clean even before it hits its shelf life! Jokes apart, let’s begin cooking. Shall we? Heat oil in a pan and add mustard seeds, cumin seeds, urad dal, red chilli, hing and curry leaves. 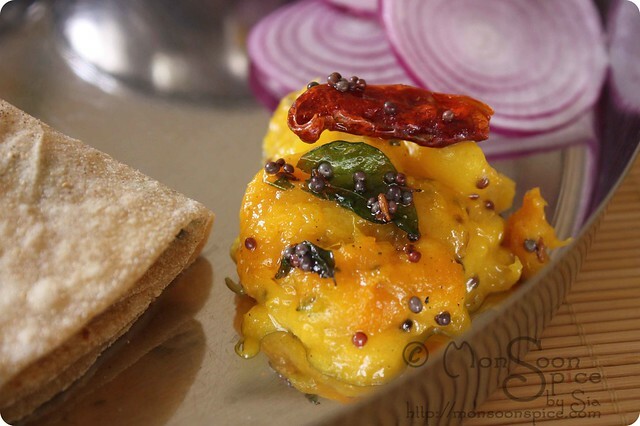 When mustard seeds starts to crackle, add diced mango pieces and mix well. Mix in chopped green chillies, jaggary, turmeric, salt to taste and ¼ cup water. Cover and cook on medium flame for 5 minutes. Mix the ingredients again and cook uncovered on low flame for another 7-10 mins till mango pieces are cooked well and get easily mashed with the back of ladle. Let the chutney get cooled completely before transferring it into a sterilised jar. This chutney/relish can be stored in refrigerator for up to 2 weeks. It goes well with dosa, idli, chapatti or with simple curd rice. Replace green chilli with crushed red chilli for different taste. Hi Sia nice to hear from you once again. You were the first few I followed and have inspired me to try my hand in cookery blogging. Thanks!! 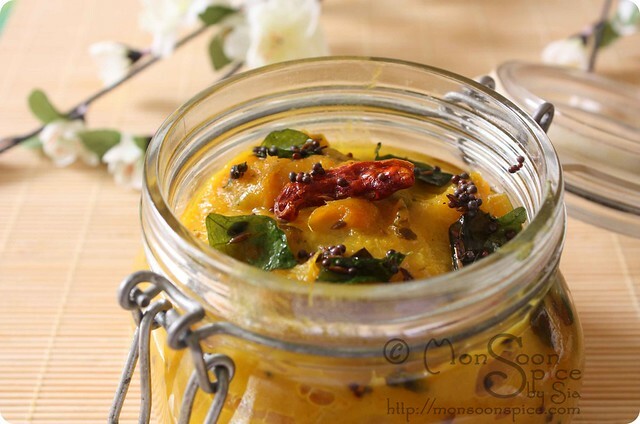 Coming to the recipe at hand can we use totapuri mangoes for this relish as mango season is long gone here. Do swing by my place when you have the time. ooh. I wish I could taste some of this chutney now. Sounds amazing and looks so delicious! 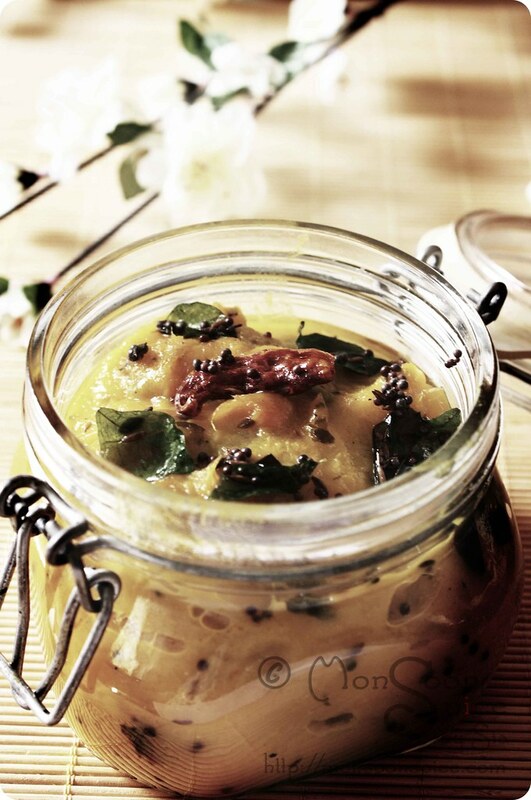 Perfect and tempting chutney.. looks absolutely delicious.. Love the preparation and presentation !! Delicious chutney and beautiful clicks.. SERIOUSLY addictive is about the right way to define this! I'd love that, I'd eat mine from the jar, with bread, rice, dal-rice, yogurt- rice, rinse, repeat! 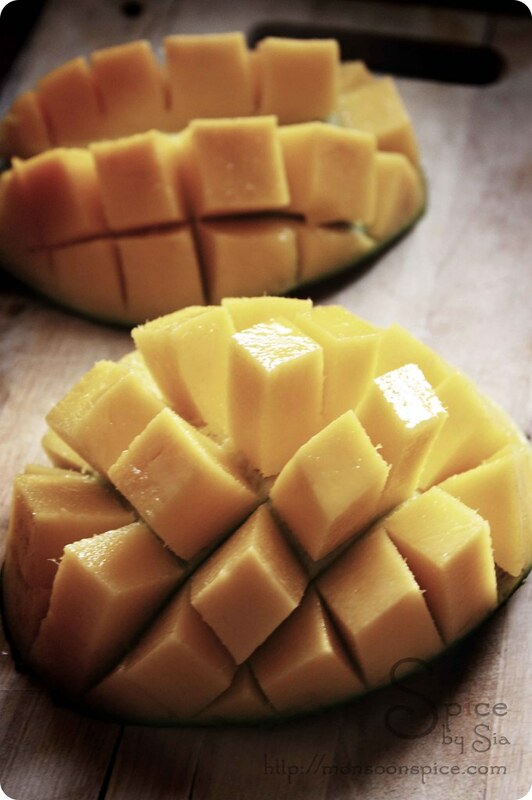 Anything with mango, bring it on, beautiful clicks !!! Welcome back Sia.. Hope the little one is doing good. Mango relish definitely sounds and looks tempting. I bought some mangoes this past weekend and will make this relish soon. Thanks for sharing. yummy n delicious chutney! !tempting click! Great..You finally make ur appearance on Monsoon Spice..Im a recent follower of ur space & checked out all ur posts...Tried out a few...Loved them all!!! Was now looking fwd to more such mouthwatering recipes!!! 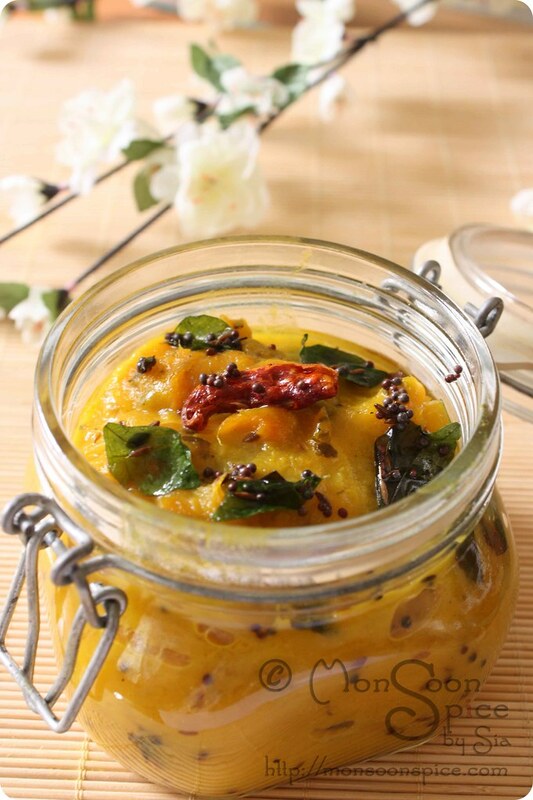 This tongue tickling chutney is a perfect come back recipe..conssidering its mango season too!!! Do NOT disappear again!! Nice to see u back in action sia...the chutney looks awesome.. Welcome back Sia. I can understand how it feels when you get back to blogging after a break. My best wishes to you. That looks like a finger-licking chutney. Seriously addictive. mouthwatering and yummyyyyyy. can i use thoothpuri mango? please give suggestions. So glad to see one of my favorite recipe blogs back! Welcome back! We missed you around here.. Chutney is very inviting and tempting! Thank u all for the warm welcome:) I'm touched. @Archana & Malini: totapuri will taste really good. but make sure that they r half ripe to get chutney consistency. Nice chutney, even looks delicious. good to see u back..the pickle looks just yumm..am drooling looking at the pic..guess what happens when I make this one!! welcome back Sia!, beautiful click!, yummy chutney! yummmyyyy...it tastes as good as it looks..
yuuummmyy sia...it tastes really good..loved it.